Text of Speech Yesterday, December 7, 1941 — a date which will live in infamy — the United States of America was suddenly and deliberately attacked by naval and air forces of the Empire of Japan. The Infamy Speech was delivered at 12:30 p.m. on December 8, 1941, by United States President Franklin D. Roosevelt, one day after the Empire of Japan's attack on Pearl Harbor Naval Base, Hawaii. 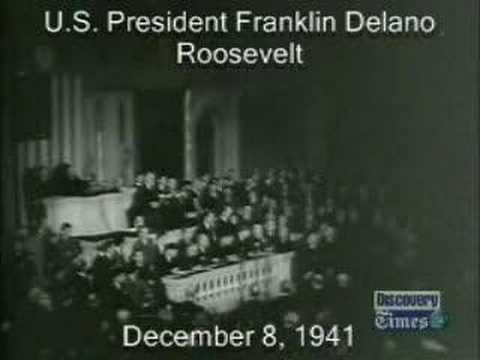 The name derives from the first line of the speech: Roosevelt describing the previous day as "a date which will live in infamy". 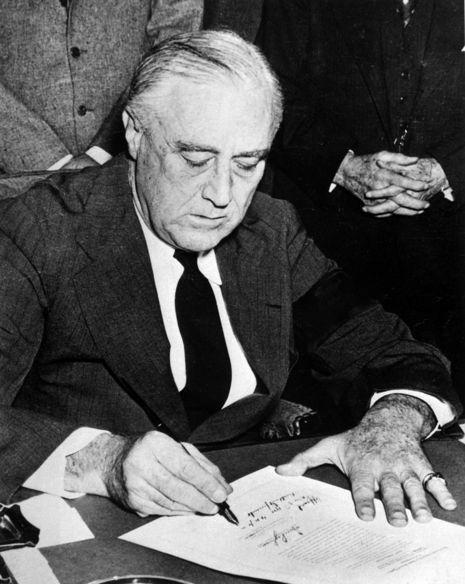 Within an hour of the speech, Congress passed a formal declaration of war against Japan and officially brought the U.S. into World War II. The address is regarded as one of the most famous American political speeches of the 20th century. The Infamy Speech was brief, running to just six and a half minutes. Secretary of State Cordell Hull had recommended that the president devote more time to a fuller exposition of Japanese-American relations and the lengthy but unsuccessful effort to find a peaceful solution. However, Roosevelt kept the speech short in the belief that it would have a more dramatic effect. The wording of Roosevelt's speech was intended to have a strong emotional impact, appealing to the anger felt by Americans at the nature of the Japanese attack. Roosevelt purposefully framed the speech around the perceived low moral character of the Japanese government. He drew a sharp contrast between the "righteous might" of the American people and the aggressive and deceitful nature of the Japanese regime. He deliberately avoided the Churchillian approach of an appeal to history. Indeed, the most famous line of the speech originally read "a date which will live in world history"; Roosevelt crossed out "world history" and replaced it with "infamy", as seen in the annotated copy of the original typewritten speech from the National Archives. His revised statement was all the stronger for its emphatic insistence that posterity would forever endorse the American view of the attack. It was intended not merely as a personal response by the president, but as a statement on behalf of the entire American people in the face of a great collective trauma. In proclaiming the indelibility of the attack and expressing outrage at its "dastardly" nature, the speech worked to crystallize and channel the response of the nation into a collective response and resolve. The first paragraph of the speech was carefully worded to reinforce Roosevelt's portrayal of the United States as the innocent victim of unprovoked Japanese aggression. The wording was deliberately passive. Rather than taking the more usual active voice—i.e. "Japan attacked the United States"—Roosevelt chose to put in the foreground the object being acted upon, namely the United States, to emphasize America's status as a victim. The theme of "innocence violated" was further reinforced by Roosevelt's recounting of the ongoing diplomatic negotiations with Japan, which the president characterized as having been pursued cynically and dishonestly by the Japanese government while it was secretly preparing for war against the United States. Roosevelt consciously sought to avoid making the sort of more abstract appeal that had been issued by President Woodrow Wilson in his own speech to Congress in April 1917, when the United States entered World War I. Wilson had laid out the strategic threat posed by Germany and stressed the idealistic goals behind America's participation in the war. During the 1930s, however, American public opinion had turned strongly against such themes and was wary of—if not actively hostile to—idealistic visions of remaking the world through a "just war". Roosevelt therefore chose to make an appeal aimed much more at the gut level—in effect, an appeal to patriotism rather than to idealism. Nonetheless, he took pains to draw a symbolic link with the April 1917 declaration of war; when he went to Congress on December 8, 1941 he was accompanied by Edith Bolling Wilson, the widow of the late president. The "infamy framework" adopted by Roosevelt was given additional resonance by the fact that it followed the pattern of earlier narratives of great American defeats. The Battle of the Little Bighorn in 1876 and the sinking of the USS Maine in 1898 had both been the source of intense national outrage and a determination to take the fight to the enemy. Defeats and setbacks were on each occasion portrayed as being merely a springboard towards an eventual and inevitable victory. As Professor Sandra Silberstein observes, Roosevelt's speech followed a well-established tradition of how "through rhetorical conventions, presidents assume extraordinary powers as the commander in chief, dissent is minimized, enemies are vilified, and lives are lost in the defense of a nation once again united under God." The overall tone of the speech was one of determined realism. Roosevelt made no attempt to paper over the great damage that had been caused to the American armed forces, noting (without giving figures, as casualty reports were still being compiled) that "very many American lives have been lost" in the attack. However, he emphasized his confidence in the strength of the American people to face up to the challenge posed by Japan, citing the "unbounded determination of our people". He sought to reassure the public that steps were being taken to ensure their safety, noting his own role as "Commander in Chief of the Army and Navy" (the United States Air Force was at this time part of the US Army) and declaring that he had already "directed that all measures be taken for our defense". Roosevelt also made a point of emphasizing that "our people, our territory and our interests are in grave danger" and highlighted reports of Japanese attacks in the Pacific between Hawaii and San Francisco. In so doing, he sought to silence the isolationist movement which had campaigned so strongly against American involvement in the war in Europe. If the territory and waters of the continental United States—not just outlying possessions such as the Philippines—was seen as being under direct threat, isolationism would become an unsustainable course of action. Roosevelt's speech had the desired effect, with only one Representative voting against the declaration of war he sought; the wider isolationist movement collapsed almost immediately. The speech's "infamy" line is often misquoted as "a day that will live in infamy". However, Roosevelt quite deliberately chose to emphasize the date—December 7, 1941—rather than the day of the attack, a Sunday, which he mentioned only in the last line when he said, "...Sunday, December 7th, 1941,...". He sought to emphasize the historic nature of the events at Pearl Harbor, implicitly urging the American people never to forget the attack and memorialize its date. Ironically, the misquoted term "day of infamy" has become widely used by the media to refer to any moment of supreme disgrace or evil.